Large capacity 2.1 cu. ft. Over-The-Range microwave that cooks evenly and relatively fast with a 400 CFM vent fan. 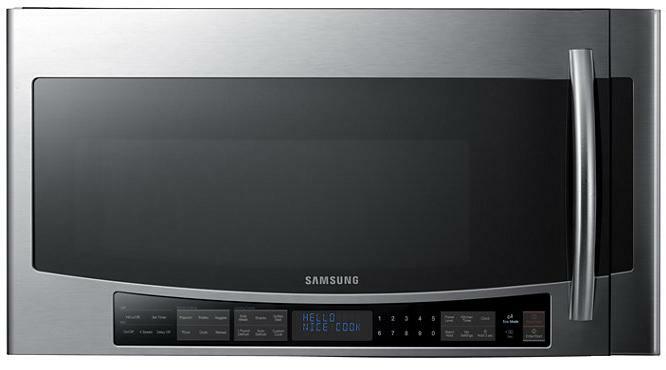 While stores advertise it as 1000 Watts, Samsung’s website says 950 Watts of cooking power. Its odd behavior and reliability are worrisome, and push button pads seem to wear easily. A Samsung service visit left it (and me) in worse condition than before they came. This microwave looks good with a roomy ceramic interior and has a center rack for heating more than one plate at a time. This was one of the reasons we chose it. It has LED lighting which when used as the over the range light, provides two-levels of very modern cool white illumination. Installation was straightforward. I had pre-drilled the mounting holes in the cabinet above before installing the cabinet onto the wall. In the shipping carton, there was a drilling template for both the above cabinet and the wall. While I had the cabinet in the shop, I cut the rectangular openings for the fan duct that went to the outside of the house. I also installed a separate 120V-20A circuit for the receptacle mounted in the cabinet so the plug would be out of sight. This ensures a nice clean, out of sight power circuit for the microwave. The carton also had a metal bracket that affixes to the wall with at least 3 bolts, at least one or more should be screwed into a wall stud. The microwave is not easily handled by one person, so get a friend to help lift it into place and to help thread the electrical cord through the cabinet holes. The microwave needs to have the blower fan adjusted for exterior vent or inside operation. If there is no venting ductwork, the microwave fan will take air from underneath (above the range) and exhaust it into the room. The carton contains a carbon filter and two metal grease filters to reduce cooking odors and particulates in the exhaust. The carbon filter is unnecessary if venting outside. There is not much difference between this microwave and any others. The “Custom Cook” button allows you to change the power level, but it’s not intuitive. It’s a microwave – right? It does have some quirks, though. The odd behavior that it exhibits is that the 4-speed vent fan will drop down to speed 1 as soon as you start cooking anything. You must then hit the fan speed button again to get it to speed 2. While you are cooking, it won’t go above speed 2. This is not helpful when cooking things like popcorn or broccoli. The food odors don’t get vented out very well on speed 2. When the microwave is not cooking, you can use all 4 speeds of the fan as a range hood exhaust taking any vapors or odors away into the vent to outside. The fan noise can get annoying after a while because its moving a lot of air – and moving air makes noise. The buttons on the front panel have a very thin textured covering on this model. I’m not sure why – possibly styling only. Unfortunately, that texture wears off easily and looks like it needs to be cleaned all the time. It’s virtually impossible to keep your hands clean while cooking, and these are the most used buttons when cooking. I’d hate to think that Samsung selected a material that was harmed by the cooking oils that might get on the surface when touching the buttons. But looking at them close-up, it appears that the coating is breaking apart so I don’t expect this microwave to look clean and stylish for very long. We’ve been using it for 7 months and the pictures show considerable deterioration of the surface coating. We clean it with mild dish detergent and a sponge after each use. The microwave was intermittently resetting power from the day we first installed it, so we question its reliability. We placed a service call to Samsung, first through their support website. I explained that the microwave would randomly reset while cooking and running the fan (a fairly common thing to do). he reset would cause the clock to lose its time. This was pretty much an instantaneous event. I was able to duplicate it at will while cooking something and by hitting speed 3 of the vent fan. Samsung support had me use an extension cord to the unit instead of plugging in to the receptacle inside the cabinet as a diagnostic to see if it was the cabinet AC supply. When it was obvious that the problem was in the microwave, Samsung agreed to send a service person out. Luckily, we had not recycled our previous OTR microwave yet. NEC repair services arrived about a week later. The tech immediately changed out the entire front door and all its controls. The problem remained. He then replaced the power supply in the main body of the unit. A different problem appeared. The power supply is a two-piece unit, so he started to use one of the pieces from the original power supply to replace one of the pieces of the new one. Unfortunately, I spent a good portion of my career fixing very complex electrical equipment all over the world and I had to intervene here. He had already changed out two parts and created a new problem (a major diagnostic mistake). So I asked him to replace the original door to see if the problem was fixed with just a new power supply. That left only a single new part in the diagnostic procedure. The second problem remained showing that the “new” power supply was faulty. The tech then replaced a piece of the new power supply in the microwave with one from the original power supply. Now all the LED segments on the display panel were always lit. The microwave worked, but you could not see what the screen said. Throughout this entire procedure, the tech was on the phone with his own Tech Support. I was interrupted by another appliance delivery. Ironically enough, this was a Samsung dual electric range (see my review here) that had to be installed directly under the microwave. While I was busy with the delivery people, the tech left the house (I thought he was getting parts from his car). I was wrong – he went away in his car without telling me anything about the next step in the repair visit. After calling Samsung support back, I was told the next day that they were waiting for their tech support to tell them what the next step was. I was stunned and extremely unhappy with their service. It took another week before Samsung told me that they would replace the entire oven. Lucky me, I still had my old one to use. 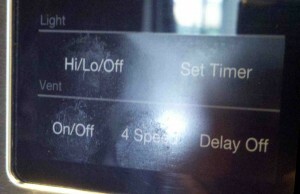 I don’t like to prognosticate, but this wasn’t the first Samsung microwave we bought for this project. The first one we bought would not power up with an error code of “SE”. The replacement was filthy – already used with food stains. The store did not have another of the same model, but gave us a free upgrade to this one. The replacement did not work at all when I took it out of the box – no error code, no power. The store replaced it with this one which was also used, having food stains on the inside and grout stains on the outside. When the store couldn’t find a replacement, they asked if it worked and when I said yes, offered me a price that I could not refuse. I cleaned it up myself. Forgetting the used and dirty ones as “retail store issues”, there were three faulty Samsung microwaves installed before I got this one installed. And this one has it’s faults. In fairness to Samsung Customer Support, they reimbursed me for the final installation. This microwave’s fan speed 3 stopped working after 2 months of use. Speeds 1, 2, and 4 worked. Somehow, fan speed 3 magically came back about a month later and it’s been running fine since. The popcorn setting on rare occasion will stop before the bag is popped. Simply hitting the “Popcorn” button again will work fine. Pros: Nice unit when it’s working. Stylish and modern looks compliment our new kitchen. Cooks evenly and reasonably fast. Cons: Reliability is still a question in our minds, push button finish wears away and looks bad, vent fan can be loud and annoying, and every once in a while something doesn’t work, then does again. Bought this unit in March of 2014. Within days it started to malfunction. Opening the door would cause the light to go out, the turntable to start, the fan to run (hopefully not the emitter too but can’t tell). Closing the door reset the whole display and wiped the clock. When it does work, the fan even on high is not sufficient to draw out steam from the front burners, only the rear ones, despite being very loud. Heating is very uneven and takes a long, long time compared to our old 1000 watt stand alone microwave. As of November 2014 we’ve had 3 service calls by the local authorized Samsung repair shop and no satisfaction. They are coming to take the unit away tomorrow for “advanced diagnostics”. I’ve just googled an found dozens and dozens of similar complaints. If Samsung had any integrity, they’d issue a product wide recall on all these units and replace them or give full refunds. Our Samsung Microwave SMH9187S had to have it motherboard replaced twice now in less than 3 years due to known SE and 8888 errors, it now only runs a few seconds and stops. According to their own technical repair specialist it is a design problem with moisture which occurs when cooking food on the stove below the Samsung over-the-range Samsung Microwave SMH9187S units. (Very Expensive Issue for the consumer to continuely have to fix) see all the complaints with Samsung on the Internet regarding not fixing known design and potential safety issues. It appears Samsung discontinues its products once issues start to mount to avoid additional liability. It appears they like to use the customer as their product testing guinea pigs. Samsung just say it’s now out of warranty and not our problem, call a Samsung authorized service company to have repairs made. This will be the last Samsung product we ever buy again. (that includes everything Samsung makes from refrigerators, oven, stoves washers, dryers, phones, tablets, TV,s, laptops, electronics, etc. an especially microwaves) When a company knowing refuses to stand behind its product, design and not fix defects the only course for consumers is to not trust or purchase any products from that company and warn all your friends and neighbors regarding of the companies business practices after the sale and they have got your money. Fool/cheat me once shame on you, fool/cheat me twice shame on me. I normally put the exhaust fan on when boiling a pot of water on the stovetop below so it’s good advice to those Samsung Microwave owners. I agree with you on support and warranty issues and that applies to all manufacturers. I hope Samsung is not ready to join the throw-away and replace mentality of many manufacturers today. Perhaps a great American manufacturing company will come along again and show them how good service keeps customers. A different approach would be to make their parts information public domain when they discontinue manufacturing it. Most motherboards can be repaired, but without the documentation, it’s difficult at best. If there is enough demand, some enterprising company might make the parts available if the economics justify it. I bought this microwave 3 1/2 years ago. Mine did the same thing after 4 months or so. I was too busy that year to get it repaired. It still works if you open and close the door a couple times. However, now it won’t work at all. Light on screen flickers when opening door. I should have had it repaired or returned, but I was just too busy. I didn’t realize I paid so much for it, because now I need another one and $400 is a lot of money. The only thing that has gone bad for me was the door interlock switch. The oven appears to turn on when you close the door and haven’t hit any buttons yet. I was concerned that it was on with nothing in it. After a brief investigation, I find that there are two interlock switches for the door. If either one does not work, the light and turntable will go on but no power will go to the microwave cooking coils. I replaced the switch (not too difficult) and it has been fine ever since. The only other nuisance is that the glass in the door tends to slide right over time and the door starts to stick. I found that putting a thin plastic spatula in the space between the door glass and the side of the oven allows me to push it back in place to the left easily as I close the door. It works fine for maybe 6 months. I think if you hang on the door to heavily, the glass moves slightly each time you use it. Bought our house that someone flipped. They put all Samsung appliances. The dishwasher motherboard went out the first week we moved in. We have now been here 10 months and the microwave just went out. Holding my breath for the stove and refrigerator. Sorry to hear you’re having such bad luck. One of the things I did early on was to put a whole house surge protector in my electric breaker panel. I haven’t had any problems with electronic equipment since then. There are receptacles available with surge protectors built in that may help your situation if the power quality is the cause. You simply replace the receptacle that the appliance is plugged into with the newer surge protection type. Look for them at big-box retailers. Purchased the microwave in 2013,very low usage,the plastic around the door is gone,very poor quality,not recommended to buy.